Understanding anatomy from the Ancient Chinese or Taoist perspective is central to understanding many forms of Taoist meditation. Taoist anatomy works using a system of ‘inner alchemy’ alchemy being a process whereby raw materials are turned to precious stones. Unlike Alchemy itself, this inner alchemy aims at no material gain, but rather at the transformation of the individual and melding of themselves back to a state of harmony with the world and Universe, a state that is not experienced for most people from their early childhood onwards. Taoist anatomy is complex, based around two columns (front and back) that co-ordinate up the length of the spine. Each of these three columns has three main energy points. The aim of Taoist practice is to draw natural energy up through the body and open the six energy points which run along the ‘posterior’ (rear) and ‘anterior’ (front) passes (or routes), either side of the spine. This ‘firing process’ similar to ‘firing up’ a steam engine or ship, aims to utilise the movement of the breath to activate natural energy field in the body via the six main passes (with names such as ‘Zen Valley’ and ‘Yellow River’). If this is successfully achieved it is believed that health and vitality can be improved and longevity can be increased. Besides these six points, Taoists believe that there are many other vital points in the body, many of which correspond to organs and glands not understood until long after the development of Taoist anatomy. There are also many parallels between these points and points considered important by non-Taoist spiritual practitioners. Notably, Taoists place great emphasis on the awakening of the ‘Celestial Eye’ placed between the eyebrows and thought to be associated with psychic powers. This relates to the 6th Chakra in many Yogic practices and other forms of Chakra healing/meditation. One thing that must be borne in mind when considering Taoism is the time that passed since original discoveries were committed to paper (some several millennia ago) and now. Because so much time has elapsed and because we in the West are in the position of translating Taoist texts into another language with entirely different alphabet, there appears to be something incredibly obscure, mystical and even ‘head in the clouds’ about Taoism. This shouldn’t be the case, and in fairness it should be considered that the same thing could be said about Christian texts in the relatively short time since they were formulated into the Bible as we currently know it. Alchemy at the time of Taoist philosophy being written had a special significance in literature as was often referred to for the imagery it evoked – fire referring to passion, destruction and renewal. Indeed, fire is referred to across many religions without being taken literally: Jesus claimed that he wished to ‘set the world’ on fire’, for example! 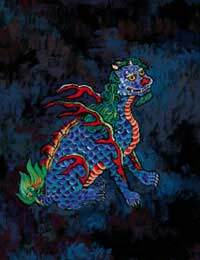 Tigers and Dragons are also referred to in alchemical and Taoist speak and although this lends itself to certain flights of fancy; the tiger merely refers to physicality, and the dragon to spirituality. In this sense, and as has been argued by some commentators, the exact positioning of energy points in the body may also be to some extent symbolic and for many people irrelevant. However, for those wishing to unravel the mysteries of Tao, a look at the language and symbolism used can be an important guide along their own spiritual path. It is beyond doubt that systems of thought like Taoism and Hatha Yoga have been of great help in developing many people spiritually over time.